The Grand InterContinental Seoul is proud to announce the appointment of its new Director of Operations Korea and General Manager. Mr. Hans W. Olbertz (53) brings to Seoul a wealth of knowledge as an hotelier and a three-decade career of working for the InterContinental hotel chain. 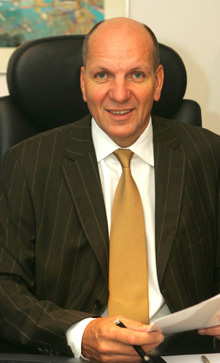 A well-traveled German with 35 years of international hospitality experience, Mr. Olbertz has served as General Manager of various hotels such as InterContinenetal Hotels in Austria, Jordan, Greece, Egypt, Germany, China as well as executive positions at the United Arab Emirates, Thailand, and England. He began his career at the age of 17. Mr. Olbertz is known for his outstanding leadership abilities. He feels it is important to keep an open mind, make the effort to work for the team as a whole, and look for positive solutions to problems. He graduated from the School of Hotel Administration for Business with a diploma as a Hotel Economist. He looks forward to experiencing new cultures and foods and while in Korea plans to enjoy his hobbies such as tennis, golf, ski, football as well as traveling.